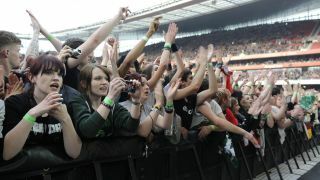 Green Day frontman Billy Joe Armstrong is the latest rock star to call out fans who use their mobile phones at gigs. After Slipknot’s Corey Taylor and Disturbed’s David Draiman took action to stop fans using their phones at shows, the Green Day singer has issued a plea for there to be more “human interaction” between the band and their audience. According to The Star, Armstrong told those gathered at a Q&A session in London: “At our shows I see lot of people holding up cell phones. You can look at a screen at home, you can look at your computer or your phone anywhere. Armstrong was also asked for his thoughts on Donald Trump’s victory in the US Presidential election – and he pulled no punches in giving his response. Green Day released their latest album Revolution Radio earlier this year.